Gary Chambers is a mechanic, and a retired farmer and Cummins Engine employee. 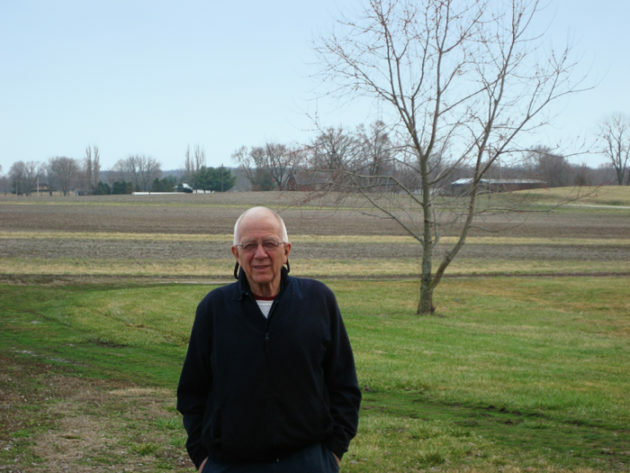 He is a Sycamore member whose family donated a conservation easement on their farm in Bartholomew County. Gary sat down with our staff at his family farm, where he told us this moving story about why he chose to become conservation partners with Sycamore Land Trust. acres, according to my mother. I started farming with my dad when I was 15 or 16. Dad and I were buddies. We farmed together for 43 years. I enjoyed farming. It’s like a disease and you can’t ever get over it. I still miss it. I loved shelling corn in the fall. I just like what the dirt smells like. I learned over time to respect all that work and admire what my grandpa and great-grandpa had gone through. This place is special. It’s more than just dollars and cents. It’s part of my life, my family’s life, and it needs to be protected. I saw the property was going to fall into my hands, as part ownership with my sister. Multiple-hand ownership almost without fail ends in sale. It gets put on the auction block to the highest bidder, and that isn’t gonna be a farmer. Things went on for several years in the discussion phase: what’s the right thing to do? My mom and dad both thought it perhaps was a good idea. They discussed it over again and again with my aunt, who’s half-owner of the farm. My dad passed away in 2003. My aunt and my mom signed the papers in 2004 to protect the farm through a conservation easement with Sycamore Land Trust. I feel really, really good about what we did as a family. The steps that were taken to protect it worked. It’s protected. I like money as well as anybody else. But we are put on this earth, according to the Bible, as caretakers. I believe with all my heart there needs to be more concern about using natural resources, our land, with care. I would have people who own farmland think seriously about protecting it. Everybody who would do something like this would do it for a different reason. Maybe their family wants different uses for the land, maybe they’re the only two left, or perhaps they want their kids to be able to sell it but have it have more productive value than as a housing complex. wanted to come down from the nursing home in Columbus and look at the farm one more time. She sat and looked out over the green wheat growing and the Sycamore sign for a while. “You know what, Gary? I think I did a good thing.” I told her, “Yeah, you did the best possible thing for our family.” And a few days later she passed away. I can sit in my shop every day, look out over the farm, and watch the seasons change. It makes me happy. I can go to bed at night and rest easy that this place is going to stay the way it is.